Springfield City Hall is located at 76 East High Street, Springfield, OH 45502; phone: 937-324-7300. Photo: Westcott House, ca. 1908, 1340 East High Street, Springfield, OH. 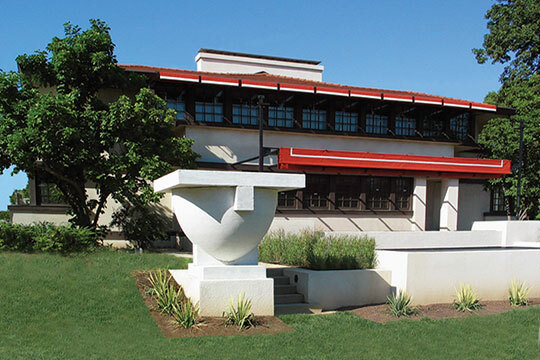 The only Prairie-style house in Ohio designed by Frank Lloyd Wright. Listed on the National Register of Historic Places in 1974. Photographed by user:RRaphael (own work), 2005, [cc-by-3.0 (creativecommons.org/licenses/by/3.0)], via Wikimedia Commons, accessed June, 2015. Founded in 1801 by James Demint, Springfield became the seat of government for newly-formed Clark County in 1818. Springfield was the terminus of the National Road for about a decade during which time politicians played political football vying for their preferences in which direction the road would continue from that point. The city is located along the Mad River, a tributary which meets the Grand Miami River at Dayton, the seat of Montgomery County.